Our customer from Vietnam is a large ship transport company, they purchased a 50 ton hydraulic towing winch and a 80 ton hydraulic mooring winch for their facility, the wire rope capacity is up to 200m, the total quantity is 5 sets, and the total contract amount is USD 500,000. Our company took charge of the shipment, installation and other services for our customer. 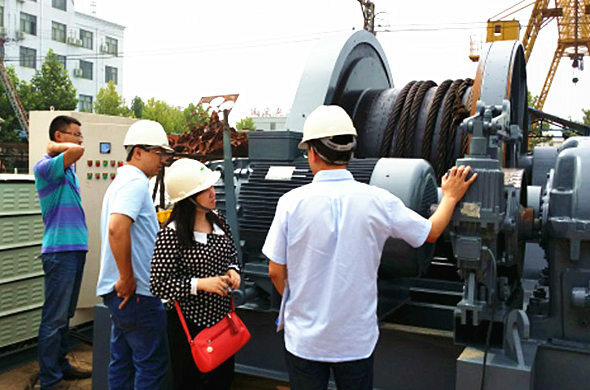 Our client inspected the winches in our factory accompanied by our engineers. For our high quality winches, reasonable price, and excellent service, our client is very satisfied with our products and service. We are constantly pursuing perfection and profession in designing and manufacturing reliable winches for our clients.